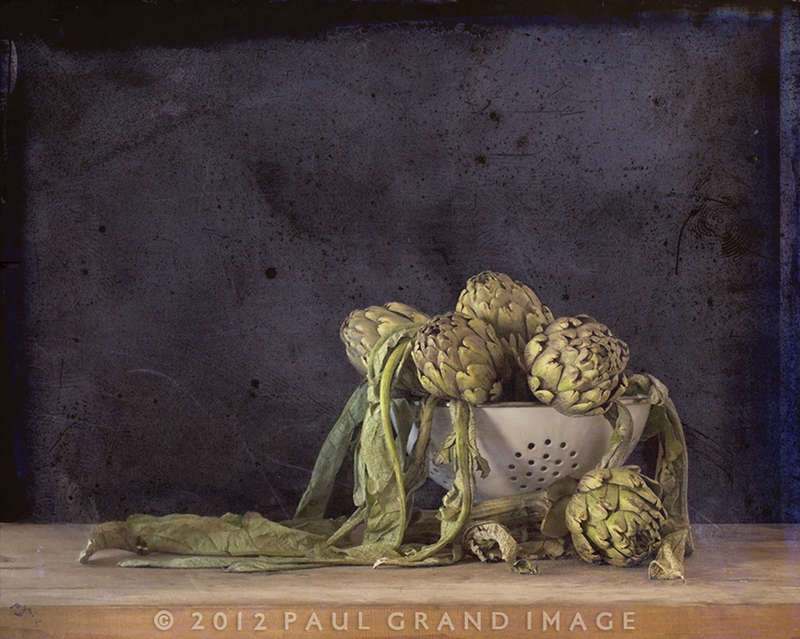 I dont think I ate an artichoke until I was a student? After finishing a water-colour still-life of them, as it would have been a crime to throw them out. I’m not saying we lived on just potatoes and boiled cabbage, but up in Yorkshire such things were frowned upon and were seen as being somehow pretentious at best, and eating the very devils food at worst! For this shoot I’d already tried them in a retro tin enamel jug, the look was totally different, and it just used window light, but it was lacking something, it was basically too much of a dead life! But today having learned from my previous days dud shoot, I brought in the big guns, my very under used pro-lighting Cactus soft box, I have three but only used one here, small steps Grasshopper! I placed it very low it at the side, about a foot to the left, and peeled back the corner of the outer transparent gauze around 6 inches to let a bit more direct light onto the front of the subject, creating a kind-of double wrap-around light effect that worked a treat. Shooting with my Lensbaby with the new Optic 80 on a tripod, with the window also from the left, but behind the camera. The black background was a simple children’s blackboard, i’d found at the communal bins. To get the painterly effect I first ran it through the colour noise filter in CS5, and used the Paint daubs and water colour filters, the base image shown has had the de-noise process already. I still wasn’t happy, so finally, going against the grain, I pulled out the antique edges and bingo, the first choice texture added grunge interest to the black, and a lovely iridescent purple edge, used with the Pin Light filter. Further cleaning up was done, I removed the bigger scratches and back ‘holes’ in the edge grunge, but here I’m showing the pre- finished version. Im now looking forward to boiling these beauties, and dancing with the devil, with a little lemon and lashings of hot garlic butter! This entry was posted on Wednesday, April 4th, 2012 at 9:56 am. It is filed under Blog and tagged with Antique Edges, blackboard, Dutch Master, Fly Edges, France, French, Getty, lensbaby, lighting, Mediterranean, moody, painterly, Paul Grand, soft box, Spring Painterly Pack, Still Life, Tutorial, watercolour effect. You can follow any responses to this entry through the RSS 2.0 feed.